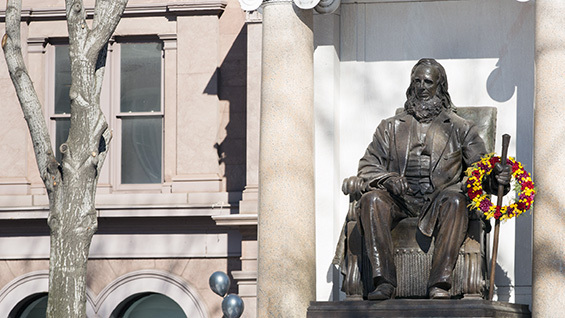 Students, faculty, alumni and staff gathered outside in freezing temperatures on February 11 to once again mark the birthday of Peter Cooper, founder of The Cooper Union for the Advancement of Science and Art. He would have been 223 years old the following day, and those indebted to his vision and philanthropy gathered as they have every year to lay a wreath over the staff of the Augustus Saint-Gaudens statue of the great man. Only this time there were significant obstacles to accomplishing that goal, besides the usual cold and roaring traffic around Peter Cooper Square. Due to an ongoing reconstruction of the entire Astor Place/Cooper Square area, the park and the statue were off limits. As a result celebrants gathered in front of the Foundation Building. 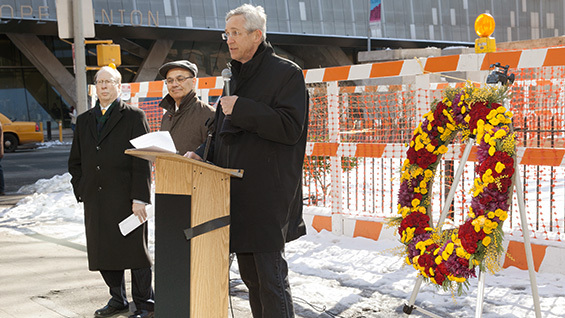 There the host, John Leeper (AR’85) president of the Cooper Union Alumni Association, Jamshed Bharucha, president of The Cooper Union, and Richard Lincer, chairman of the Board of Trustees, spoke to the crowd in spite of ongoing construction noise. Some people brought balloons. At the ceremony's conclusion the challenge of laying the wreath on the staff was overcome. A New York City Parks Department employee took the wreath over the fence and laid it upon the statue, following tradition. 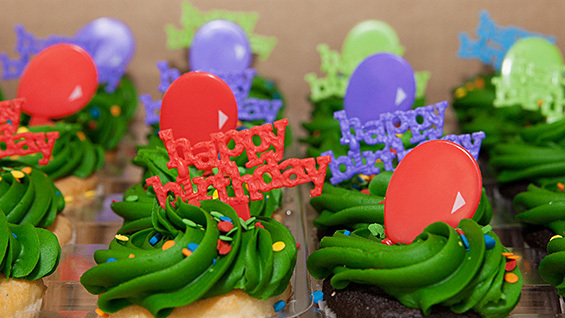 Afterwards the celebrants moved into the lobby of 41 Cooper Square, where they enjoyed cupcakes, refreshments and a bit of warmth.